Organisers of the National Eisteddfod have said they hope the festival will leave its mark on Flintshire as the event closes. The eisteddfod, which moves location every year, will be held in Cardiff in 2008. This year, the total attendance of the festival at Mold was 154,944, which is slightly down on the 155,437 who visited the Swansea event last year. 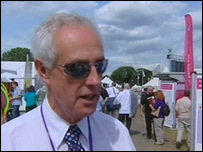 Organiser Hywel Wyn Edwards said it had been "a phenomenal success". There had been concerns that bad weather might have caused problems for the festival after the heavy rain affected the Royal Welsh Show at Llanelwedd, Powys. But Mr Edwards said the situation had improved considerably. "I am very, very pleased the weather changed and the crowds have come to the field," he said. "I am very impressed by the local people and also eisteddfod-goers from all over the area who have thronged here the week. "Hopefully the eisteddfod will leave its mark on this area and on Flintshire in particular. "I think over the last 18 months for the period leading up to the eisteddfod, we have actually stretched out into all the communities across Flintshire. "During the week we noticed that a lot of people from the local area came back not once, not twice, but more than that." He said he hoped the event would have a lasting legacy within the communities. "This time I know already that one mixed choir has been formed and that is going to carry on," he said. "And I know the learners committee are going to reform in September because they felt support from the community right across Flintshire." During the festival, T James Jones from Cardiff, won the chair for poetry on the subject of Ffin (Boundary). Elsewhere, Mary Annes Payne from Anglesey won the prose medal and Dylan Tudur Jones won the crown.